There is plenty of street, plaza and garage parking space available. If using the garage, enter through the building 44 entrance and follow the ramp down to the green color-coded section. Once parked, proceed to the door clearly marked 44. Follow the sign to the lobby and main elevators. Come up to the 4th floor and follow the sign to Café 44. Whether entertaining VIP clients or treating the whole team, Cafe 44 is sure to please. Our customized Catering Menu features many of Cafe 44’s most popular dishes along with many other new and exciting options. With its panoramic view of the Potomac River, buzz-worthy location, and stylish ambiance, Café 44 is an ideal setting for many occasions. Our expansive space accommodates up to 100 guests and encompasses a variety of seating options within the dining area as well as on the outdoor terrace. Our team works closely with guests to create a range of personalized experiences from casual get-togethers, to intimate, private celebrations. Book your event today! Café 44 is an upscale eatery situated along the Waterfront in Old Town Alexandria. Our house-made dishes, specialty coffees, craft cocktails, and panoramic view have quickly made us the talk of the town. 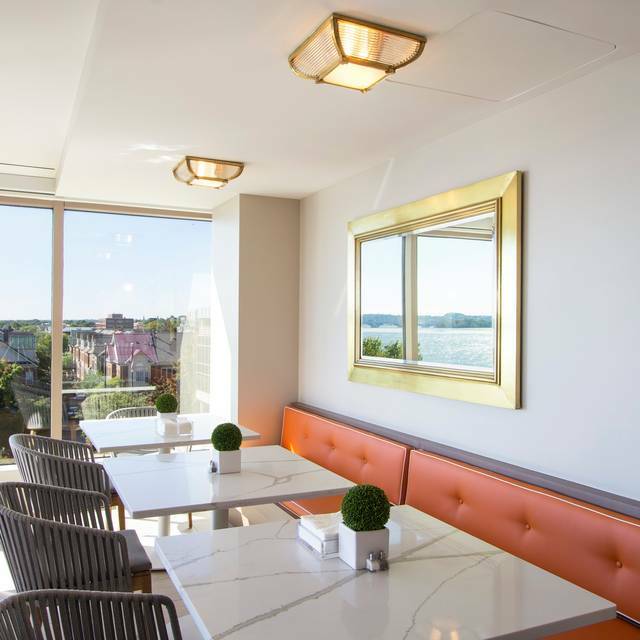 Whether dining inside or outside on The Terrace, our unique location allows for sweeping views of the Potomac River. Often described as a hidden gem, we’ve become a popular dining destination and event space. Our expansive venue features a variety of unique spaces that capture the essence of the Potomac River. From the Boxwood lounge to the inviting balcony and terrace—our location is perfect for an informal get together or over-the-top affair. Join us on our rooftop terrace or grab a seat at the bar to enjoy our spectacular waterfront view and $2 off select wine, champagne, beer, cocktails, and bar snacks. Enjoy $2 off Craft Cocktails, crab dip, and cajun shrimp cocktail. Enjoy $5 Chambong pours, 1/2 off bottles of Ruffino prosecco and rose, and $2 off select bar snacks. Join us for $10 wine flights, 1/2 off select bottles of wine, and $2 off House Specialties. Join us from 6-8pm for trivia and a $5 menu featuring wine, meatballs, and pizza. Join us for a special Easter Brunch buffet, featuring a chef-driven menu and handcrafted brunch cocktails. Great Find! Awesome Ambiance. Fantastic views. Have outdoor seating. Food and service are worthy. Delightful experience! The staff is warm and welcoming. Food is delicious. Decor is contemporary and inviting. Order the bread pudding! Looking forward to our next meal at Cafe 44! Made a reservation. Arrived early. Beautiful day. Hostess asked our dining preference for inside or outside. We opted for outside seating. Hostess took us past several open tables and sat us at a table around the corner. Hostess had no idea why the five 2-top tables we walked past were not available for seating. No "Reserved" signs placed on any table and no reservation requests. We were seated at our far away table waiting for our 1st waitress who never came. Waited at least 15 min to be acknowledged before heading back to the Hostess stand. This time we stated we wanted to sit at one of the 5 open tables outside that were unoccupied. Waiter #2 showed up and was polite and apologetic for the poor service. He was at the Hostess stand and heard our initial experience. We ordered our food from the menu as written. Part of the order prepared properly, part of the order prepared wrong and the eggs benedict were boiled and over cooked. Order had to be redone. We had to request a refill on the coffee. Outside tables sat unoccupied the entire time of we were at the restaurant dining. The ambiance is nice and the view enjoyable. 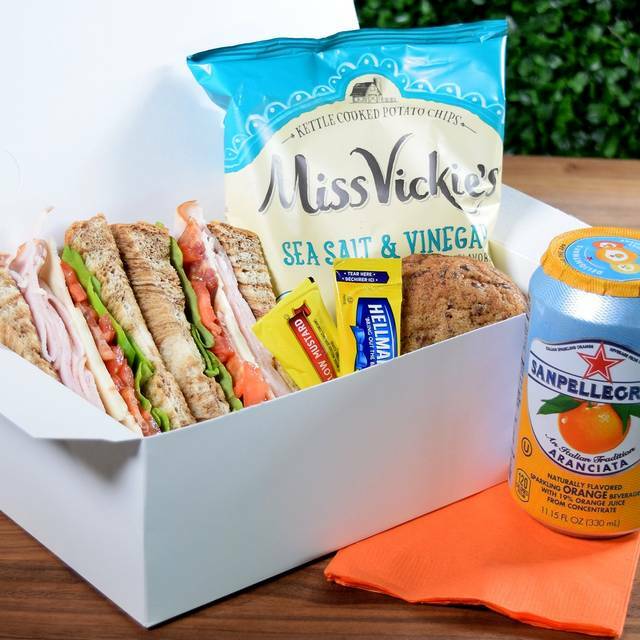 The food when properly prepared is good. Hoping that the misses we experienced in service are growing pains of a new restaurant. We have lived in Old Towm for a few years and wanted to try brunch here. Service was great as was the food. The views are probably the best in Old Town. We sat on the patio and loved it. We will definitely be back with friends! I visited Café 44 Saturday morning after a quick Google search while in the area. I was looking to take my sisters who were visiting from out of town for a quick bite and to my surprise 44 had an open reservation. Our server, Shantell, was PHENOMENAL. It's wonderful to visit an establishment for the first time and feel warmly welcomed. The bubbly flowed and the waffle gets 10 stars from me. Between the restaurants ambiance and the scenery overlooking the water, I’ll definitely be back soon! We were really disappointed. They had a super creative menu but service was slow (plus they forgot our side order of bacon & we never could find waiter to ask for it again), it was loud where we were situated next to a group, & our eggs Benedict barely had enough hollandaise for one egg. The view of the water was nice. You can't beat the view and the decor. We were the first to arrive for a 10 am brunch reservation, but waited quite a while for our food to come out. And the food was not good. The biscuit tasted underdone (it turned into dough in my mouth, so I had to spit it out). My husband's waffle was the thinnest we've ever seen, and it was soft, not crispy. The egg portion was pretty small, and my overall plate was overshadowed by the bowl of cheesy grits, which was cold and congealed (not creamy at all). I sat there without any food or drink while my husband and my friend drank their coffees -- maybe because i ordered tea with my breakfast? But I still should have received my tea along with the coffee for my husband and our friend, no? No one asked me if I wanted water. The service staff were clearly new and needed more training, but they were very nice, so I don't fault them. The manager was also very nice, but I just wonder what was going on in the kitchen. Maybe it was an off day, but for the price, there are plenty of other places in Alexandria with far better food, even without the view. Loved this little restaurant. Would definitely go back in future. The staff was very attentive but not hovering. The food was delicious, quick and exactly what we needed. The views were great from any seat in the restaurant. I highly recommend the brunch menu! This is my third time dining at Café 44. I love the restaurant, atmosphere, and ambiance. However, I do have to say I definitely prefer the Pre-fixe brunch over the Café breakfast on weekends. Also, the mimosa and Bellini are really delicious. What a lovely place. Its in an office building so access is a bit wonky but once you are in it is a lovely view and the staff are just so friendly. Its the kind of place to enjoy buckets of bubbly while surviving brunch with 3 generations of women in your family. Surprisingly, it was a result great experience! Nice servers and staff, quiet, attractive, relaxing ambiance. Good food and reasonable prices. The French 44, waffles, and ambiance were solid wins. The brunch buffet (at $25) was a waste; we should have stuck with the waffles. They were out of everything except fries, too thin bacon, and jars of salad. The exceptionally runny omelette took 15 min. The food was delicious and very good sized portions. The staff was friendly and courteous! Very surprised of how nice this place was. A well kept secret in Alexandria. I will be back. Great venue and I look forward to visiting again just to enjoy the view. The brunch menu is great and varied so there’s something for everyone to enjoy and I really liked the French 44 which was recommended by our waiter Quinton (who was great he even took a picture for our group!). The food took a little while to come out for each course of the three course brunch. The ambience was really, really nice. The food at the Saturday brunch was so delicious and fulfilling, and cooked to perfection. Our waiter, Courtney, was such a pleasure. We’ll definitely be back. We loved Cafe 44. I usually go for lunch, and this was the first time going for brunch. While everything was well cooked, I just felt that it was all very basic. Salad was plain, Benedicts were fine, and has was just basic potatoes with minimal seasoning. Honestly, the best part were the drinks. Both coffee and cocktails were delicious. It’s a good thing the prices are reasonable; next time I might try stuff a la carte. This place was an awesome find! Though it’s hidden in a business building and off the beaten path of Old Town, and the acoustics are rough (got really loud in the small space), the view was amazing and the food was delicious. Would go again and definitely recommend it to others. We went for brunch. The chicken and waffles were fabulous! Good food. Great place. / Very noise and poor service. For example; our table (earlier with 2 people) were served after three other tables (later with 4 and 6 folks. A saying for this place is: Go for the food (average), but stay for the view (great). I loved the atmosphere of the restaurant and would have loved to have gone on a nice day to experience the outdoor space. We had a table by the window and the view was great! The food wasn't fantastic but the drinks were very good. The scenery is about the best thing this place has to offer. The service was slow. The server wasn't very attentive and the food had something in it. Visited for Brunch during Restaurant Week 2019. The restaurant is a little difficult to find(it is in an office building) but, the view and ambiance is great. My positive comments stop there. The service was slow. I think to get all 3 courses of the pre-fix brunch menu it took almost 2 hours. The food was neither warm or good. The biscuits were terrible. I had the steak and eggs which was the best thing that was ordered. It was fine but, not amazing. My friend had the chicken and waffles and said both were too salty. The servers never checked on us after the food was served and forgot our final course and then brought one of us the wrong dish. The restaurant seemed ill-equipped for the number of patrons, particularly during restaurant week. Great lunch place. Great service. Fantastic view. Looking forward to returning. Very tasty food. Excellent service. We sat by the window and got views of the Potomac and planes landing at DCA. Most of the food served is not edible. The biscuit came out burnt on the edges but the inside was raw uncooked dough. Chicken and waffles: chicken was dry and overcooked akin to jerky and the waffles were dense and cold. Gelato: tastes like frozen whipped cream that you can get from a tub. The view is nice and the place is decorated cute but I wouldn't come back. Although it’s a little difficult to find your way through the building to this café, the effort is rewarded with fantastic views across the Potomac River, welcoming and relaxed ambience, and delicious food. Definitely a place we’ll be happy to return to. the vibe was upbeat without the noise being too loud. it was nice to hold a conversation! It is a great space with a fabulous view overlooking the Potomac. The food is average. Really like the Cafe 44. My organizational staff likes it also. Good food, reasonable prices, light and airy atmosphere, great service. As usual, everything was perfect – but make that MORE than perfect. Make it over the top perfect for our special occasion. What a wonderful gem! We were excited to find this place. It’s a bit out of the way and not in walking distance of Old Town’s shops. But the view was great and it was a fun place to eat. We enjoyed the brunch menu and the food was good. We were torn between telling others about the place or keeping it a secret! The parking is very confusing and I would recommend they provide better signs in the garage. It would also be nice if they validated your parking. We have loved this place from the very start, and it just keeps getting better and better. They have plans for the future to open an adjoining area for fine dining; we can’t wait for that to happen. In the meantime, it is our hands down favorite place for lunch, brunch, cocktail hours AND private parties. When a party group takes over the restaurant, the hearts of the attendees are taken over too.